Isn’t it interesting that the mainstream media offers barely a peep about the ongoing and worsening Obamacare debacle? 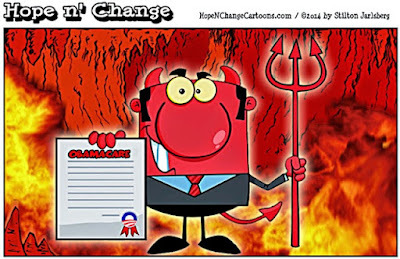 Healthcare premiums, co-pays and deductibles are soaring, while doctor and plan choices contract to a minuscule level. Recent surveys reveal the hardship being inflicted upon families across the nation. Those who are willfully baffled by the lack of consumer spending need look no further than Obamacare and its impact on the budgets of hard working Americans. Read more Jim Quinn. Cartoon: HopenchangeCartoons.com.